Almost four years after the term ‘Material Design‘ entered our lexicon in 2014, folks over at XDA say they have discovered new commits on the Chromium Gerrit that show Google is all set to bring ‘Material Design 2’ to its Chrome web-browser. While the commit has since been made private, the blog was able to go through much of the code in an attempt to gather info about what to expect from the revised and more polished edition of Google’s design philosophy. While details about the upcoming changes are hard to come by, the commits made in early February reveal some minor changes to how Chrome tabs will look going forward. Some of the changes will apparently include a slight increase in the height of the tabstrip, and a few unspecified tweaks to titles and alert indicators. As can be seen from the screenshot below, the commit apparently also indicates a decrease in the tab touch width while increasing tab standard width. The image above also shows the addition of a ‘material design 2 tab close button icon‘ as well as ‘basic color constraints required for google material design 2‘. There are also few small tweaks made to the color palette of Chromium, but nothing that you’d notice unless you’re specifically told about them. While most of the above is a bit ho-hum, one of the relatively more interesting changes to the codebase indicates that Google may be looking to optimize the touchscreen support for Chrome on touch-supported Chrome OS devices. 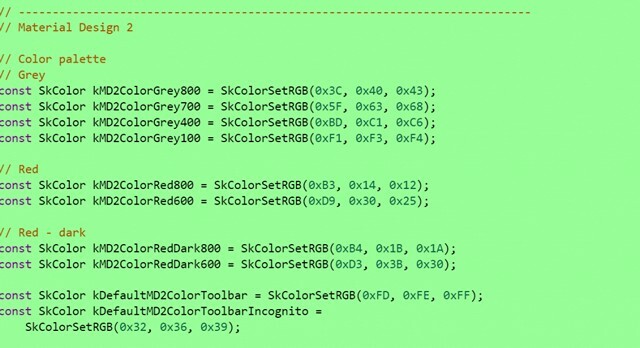 According to XDA, this was revealed by the the addition of a new IsTouchOptimizedMaterial() flag to the MaterialDesignController, although, it isn’t immediately evident as to how exactly that will improve user experience. Google has been moving towards a more unified user interface with Material Design that debuted with Android Lollipop, but has since been rolled out to many Google Apps, such as Drive, Docs, Sheets and Chrome (and Chrome OS, of course), not to mention all of Google’s own mobile apps, including YouTube, Gmail, Allo, Duo and others.